Ricardo Morris, a journalist and Thomson Reuters fellow from Fiji, has studied the perceptions and practice of self-censorship among journalists from his country in the years following the military coup in December 2006. He focused particularly on the period after the 2014 general election that returned Fiji to democratic rule. 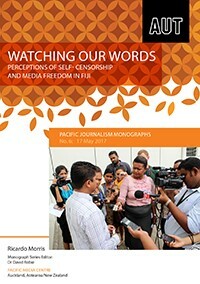 In this research monograph, Morris examines how willing Fiji’s media workers are to self-censor, how self-censorship works in newsrooms, and what factors are influential on journalists’ work. The research monograph was first published by the Reuters Institute for the Study of Journalism and has been published by the Pacific Journalism Monograph series at the Pacific Media Centre by arrangement with the author and institute. Morris is the founder, publisher and editor of independent media company Republika Media Limited in Fiji, which publishes the magazine Repúblika. Authors submitting articles for publication warrant that the work is not an infringement of any existing copyright and will indemnify the publisher against any breach of such warranty. By publishing in Pacific Journalism Monographs, the author(s) agree to the dissemination of their work through Pacific Journalism Review and on the PJR databases. By publishing in Pacific Journalism Monographs, the authors grant the Journal a Creative Commons nonexclusive worldwide license for electronic dissemination of the article via the internet, and, a nonexclusive right to license others to reproduce, republish, transmit, and distribute the content of the journal. The authors grant the Journal the right to transfer content (without changing it), to any medium or format necessary for the purpose of preservation. Established in 2012 and published by the Pacific Media Centre.